It’s getting cold down here. Time to get those BLACK wool coats out! Boring? Well, it’s all about the details! Be inspired by the Milanese and French fashionistas and wear your coat with black opaques or lace tights (like Giovanna Battaglia, left). A discrete, all-black outfit will leave the floor to spectacular heels and booties. A small belt accentuates the waist and creates an ultra-feminine look. MK Olsen (far right) shows an even more extravagant version with a long lace skirt and Burberry platform booties (perfect contrast!). Last but not least: break it up with some bright red nailpolish. Okay, Nati would go for pink…Works both perfectly! i love black! i don’t know why, maybe because i grew up and still live in Washington, DC, where everyone is super conservative. 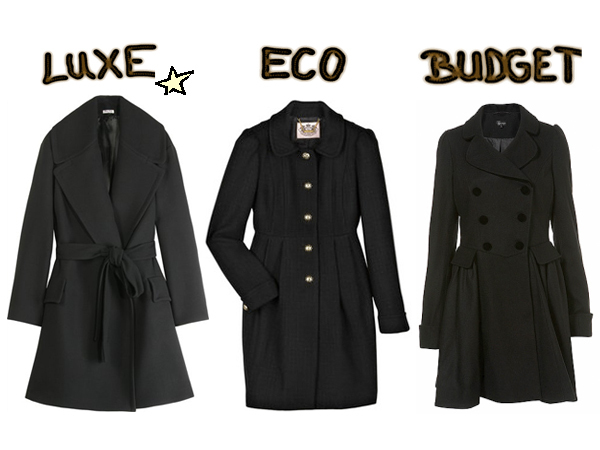 i think i own about 5 black coats! love that you included miroslava duma…she’s one of my new style icons, because although she’s petite, she can pull off any look! That photo collage is so amazing. I think I have all those photos saved individually somewhere on my computer too!